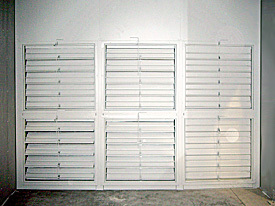 • Pipe and Duct Wrap/Lagging Beach Dynamics has been designing, fabricating, and installing soft curtain and hard paneled acoustical enclosures since 1995. 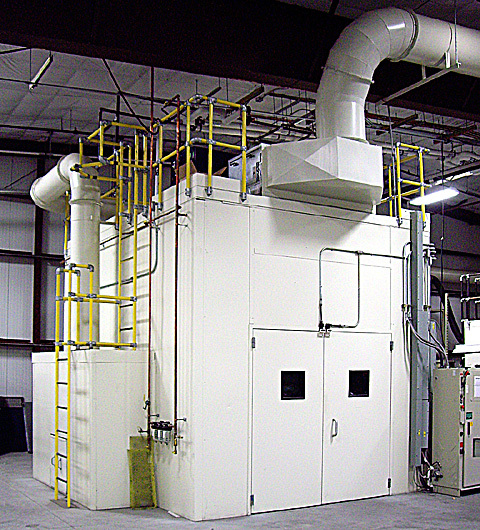 Unpainted, galvanized noise booth with automated lift door for high speed production. Note outside air inlet and exhaust duct for energy savings. Window is field replaceable. Tall Booth with manual double doors, outside air supply, and external walk-in exhaust hood. Booth features manual adjustable dampers to maximize capture velocity. 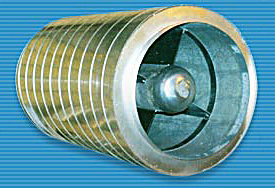 Round silencer with bullet resulting in very high noise reduction with very low static pressure loss. 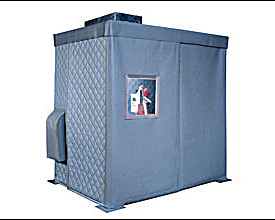 Floor mounted soft paneled noise enclosure can also be suspended by buildings ceiling. Note wall and roof mounted inlet and exhaust baffles. Panels are on are on rollers in double track for easy access for equipment repairs.